The Gold Standard: My beloved pancakes from the Deluxe Town Diner in Watertown, Massachusetts. Photo by möca. Why is it that I’m always reading blog posts and newspaper articles about great breakfast places that turn out to be subpar? Surely, I am not the only pancake purist in Rhode Island. After having eagerly gone from diner to hotspot and back again in my quest for Rhode Island’s best pancakes, I’ve decided I am going about this all wrong. 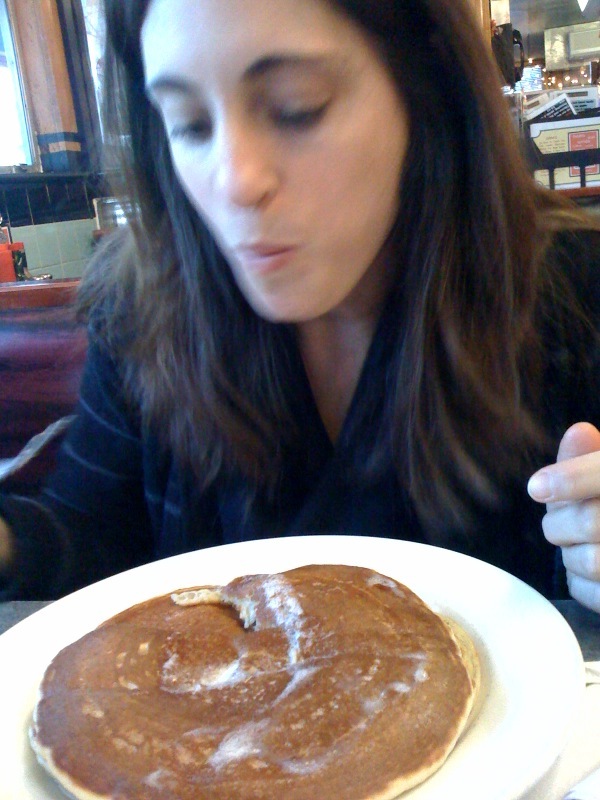 When I discovered the best pancakes near Boston, I discovered them not through a blog (if those even existed then) nor through a magazine or newspaper article, but through an accountant friend who happened to live in the area and really liked pancakes. Here I am with my Deluxe Town Diner pancakes. Here’s how I know that the Deluxe Town Diner in Watertown, Massachusetts has amazing pancakes: it is the only thing I order there. That’s not to say I haven’t been tempted by tuna melts, homemade stews with fresh (not frozen) vegetables, and burgers with sweet potato fries. But the pancakes made with sour cream and buttermilk are just too good: they rise to thick height and remain fluffy, perfectly browned, made the size of your plate in a stack of three (or two if you so choose, but you’ll be sorry), and smeared with butter with a side of real maple syrup. I know Rhode Island is the smallest state, but I refuse to shrink my expectations accordingly. So, fellow citizens, I beg of you: show me the (amazingly good) pancakes. Post a comment with your local favorite, and I promise to go, eat and report back. Note: My criteria for the perfect pancake includes: 1) fluffy texture; 2) neither too wet nor too dry; 3) excellent flavor, more specifically a well-orchestrated recipe of ingredients that culminate in a caramelized flavor balancing salty and sweet; 4) made and served with real butter; and 5) served with real maple syrup. 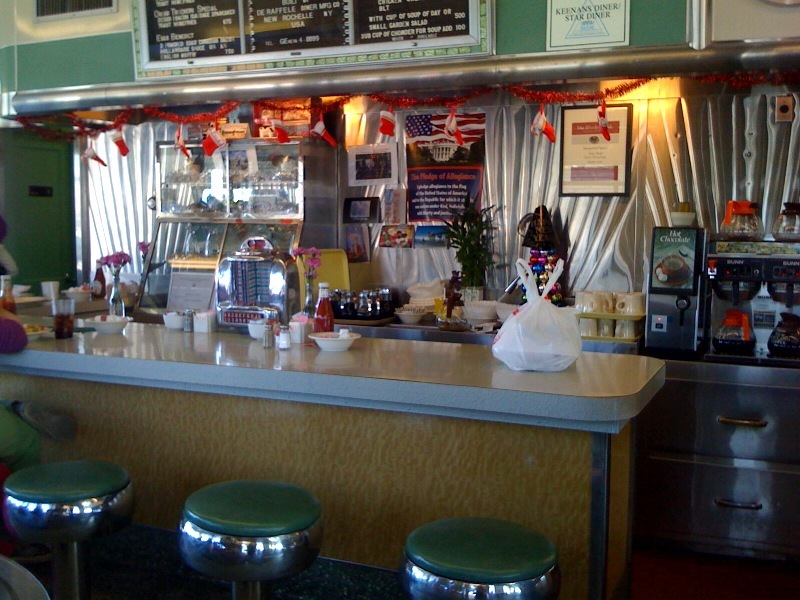 Despite a wonderful old-fashioned diner atmosphere amidst the strip malls, you won't find the best pancakes at Star Diner. Why not? One of the RI Monthly reader’s choices for best breakfasts, this is truthfully the only place I can stand to eat pancakes on Aquidneck Island. Yet they are no match for the perfect pancake (decent flavor, but not fluffy enough) and fail to provide real maple syrup. Why not? Such a cute little spot, but they use margarine — a deal-breaker in my opinion. Why not? Here you’ll find decent pancakes (although too light indicated not enough caramelizing butter, sugar, salt), but nothing spectacular, and the diner lacks real maple syrup. Why not? Although I love this place for its atmosphere and enjoy their thin old-fashioned french toast, their pancakes are thin and mealy. Why not? There is no better option when you absolutely need pancakes at 1 am and are too lazy to make them (yes, it’s happened to me). But, let’s face it, as good as they may taste at that moment, we all know that IHOP is not the real deal. Why not? Generally their pancakes have fairly good flavor, although they are always too flat and light. Plus they lack consistency: a few times, the pancakes were metallic, which Geoff says is an indicator of too much baking powder. They serve them with real butter but artificial maple syrup. Why not? 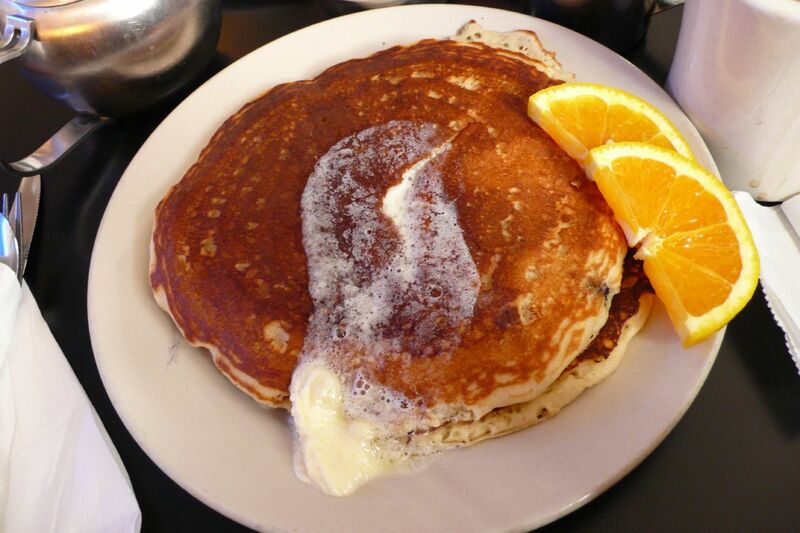 According to Providence Journal’s food writer Gail Ciampa, these are “some of the best pancakes around.” No way. Slathered with margarine, these pancakes were bound to lose. They were the right color and thickness, but ultimately too gummy with the wrong flavor. Why not? Their pancakes had great texture (just a tad wet) and were quite fluffy, yet the flavor was wrong — not sweet nor salty enough. Why not? In general, breakfast here was terrific, but the pancakes sadly not so. Cinnamon in the batter definitely doesn’t fit the bill. Why not? I had high hopes here with the homemade breads and muffins, but ultimately the pancakes missed on both flavor and fluffiness. Why not? Pancakes were greasy and burnt. By the taste, I highly doubt they were made with butter in the batter or on the griddle. And they don’t serve maple syrup. Why not? Pancakes were dense and dry with lousy flavor. They’re also served with a butter ‘blend’ (aka margarine), blanketed with powdered sugar, and a side of phony syrup — need I say more? Ocean cafe – on thames in Newport. The pancakes are not bad…..they have real maple syrup, and they make very good home friends from local potatoes. The pancakes at Graziano’s Cafe in Island Park are pretty decent. Although aren’t Johnny Cake’s the specialty of Rhode Island? Ok, I haven’t tried Graziano’s — I’ll give it a shot. As for Johnny Cakes — the ones I’ve had were pretty flat and greasy. I could be converted — any recommendations on where to get some good ones? We took a boat ride to Block Island from Rhode Island I cant remember where exactly but I can tell you the restraunt we stopped at was right across from where you buy your ticket to take your car to Block Island. I can not remember the name of the place I had pancakes at but I can tell you they where delicious. At the door of the restraunt there was a gigantic live talking pariot. That is all I remember but I can tell you they where not dry not overcooked or anything like that they came with powered sugar and maple surup and real butter. They where a home made recipe and I asked for it but they would not give it to me. I am retired now and plan on taking another ride through Rhode Island to find it.